Dr. Pirozzi was born in Brooklyn, New York and raised in North Jersey. After graduating from the University of Notre Dame in 1977 with a B.S. 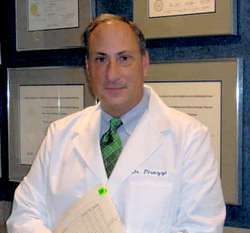 in Preprofessional Studies, he returned to New Jersey and earned his Doctor of Dental Medicine at Fairleigh Dickinson Dental School in 1981. He subsequently completed his internship, surgical residency and chief residency at Lincoln Medical Center (New York Medical College Affiliate) earning a specialty certificate in Oral & Maxillofacial Surgery in 1984. Immediately following his surgical residency, Dr. Pirozzi associated with several local oral surgery practices while teaching anesthesia and clinical oral surgery at his alma mater. In 1987, he and Dr. Ernst initiated the practice you visit today and they have continued to nurture a caring, progressive surgical practice of the highest standards. In addition to being a diplomate of the American Board of Oral & Maxillofacial Surgeons, Dr. Pirozzi is also a Fellow of the American College of Oral & Maxillofacial Surgeons and Fellow of the American Dental Society of Anesthesiology. He is a past chairman of the dental department at Saint Clare's Hospital in Denville, New Jersey where he maintains hospital privileges. In addition to full time private practice, Dr. Pirozzi has been an active participant for over 20 years in New Jersey's Donated Dental Services, a program of volunteers providing dental care to the indigent of our state. Additionally he has also volunteered his surgical services to the underprivileged citizens of Haiti in a mission of mercy. Dr. Pirozzi and our entire staff welcome you to our practice and pledge to provide treatment in a caring, sensitive and professional manner.